Summer is excellent weather for rosé wines. The vines are basking in the warm sun ready to grow this year's vintage grapes. Warm weather, lazy afternoons, cheese and cured meats on a picnic, etc. All of this just begs for a nice chilled glass of dry rosé. 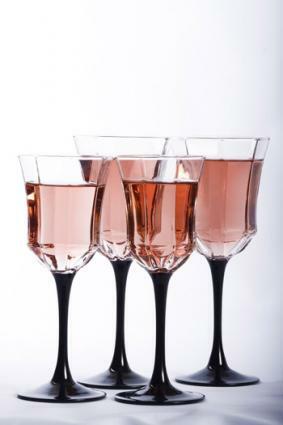 Rosé wines have been a staple on almost every table in Europe for centuries. It's inexpensive to make and usually has low alcohol and a delicious simplicity of core fruit that screams "drink me!" And they do. A lot. Unfortunately, rosé wines have had a difficult reputation here in the United States. This stems back from the late 1970s when Sutter Home came out with their White Zinfandel - a sweet, fruity, low-alcohol wine. Obviously, White Zinfandel doesn't have the best reputation in the wine world, and it's not the most sought-after wine. So, for a pink wine to be poured in the glass, the automatic reaction is to think "cheap, sweet, and thin." It's taken many years and some wineries' perseverance to bring the world of Rosé wines back to the drinking public. The popularity is growing every day! Rose Wines: Style - Not Type! No, Rosé is not a type of wine - it's a style of wine. You can make Rosé wines out of any red grapes. Most countries have their signature styles and wine varietals that they use. For example, if you're drinking a French Rosé, chances are it's from the Rhone or Loire area and made from Cinsault, Grenache, Mourvedre, and Syrah. If you are drinking a Rosé from Spain, chances are its made from Garnacha or Tempranillo. Here in the United States we do a plethora of different Rosé wines from Zinfandel, Cabernet, Merlot, Pinot Noir, Sangiovese, and Syrah. The style is dry and fruity (like dried fruit), without the sticky sweet to go with it. First, it concentrates the wine left behind in the tank with the skins. We know that the color comes from the skins, and if you reduce the amount of liquid that is in the tank, you have less to color with the skins, thus increasing your juice to skin ratio and getting more color extraction. Second, the wine extracted into a separate tank is light, fruity, dry and a whole other type of wine. For many winemakers this is a win-win situation. Characteristics of rosé wines range from the tart, acidic wines with little or no oak, to the big fruit extracted gems that scream for a strawberry to be dropped into the glass. Typically these wines are served very chilled and are a good accompaniment to a huge assortment of foods. They go wonderfully with pâtés and hors d'oeurves because of their low alcohol and flexibility with foods. It really is a "utilitarian" wine. This is a great wine from Napa Valley. It's pale salmon and wonderfully dried cranberry and spice on the nose is a must-have in my wine collection for summer drinking. This French Negociant has brought in a wonderful wine. Very inexpensive! Light, fruity, and a twist-off cap makes for an inviting wine from across the pond. This winery is known for its Chardonnay and Pinot Noir's, but don't pass on this beauty. This Vin Gris (another term for rosé) shows wonderful orange and grapefruit, yet has interesting dried cherry notes. A bit pricier, but well worth it. Known for their sparklers, every year this winery also brings out this low-production wine. This is the perfect rosé for beating the heat on a warm summer day. With an intense fresh strawberry nose, it finishes with a spicy tang that Sangiovese dishes out. I encourage everyone who shies away from pink wines to take a chance and try these beauties. They are not White Zinfandel, I promise! Next time you have a party and have light passed appetizers, pop open a bottle and watch the surprised and happy looks on your guests' faces when they see how wonderful this type of wine can be. Cheers!